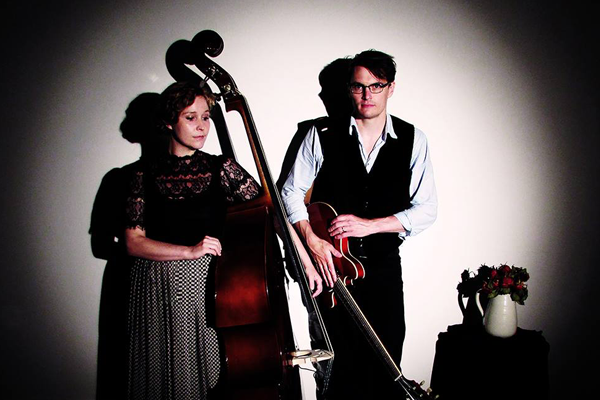 Described as “like a young Billie Holiday gate-crashing a Tom Waits Swordfishtrombones recording session”, blues and roots duo Ma Polaine’s Great Decline follow their debut album with a third EP release, Small Town Talk. Recorded in 2015 and engineered and co-produced by BBC Folk Award winner Ben Walker, the 4-track EP draws influence from a typically wide breadth of genres, and will be available on 10” vinyl, CD and download. The Small Town Talk tour takes in some of the best independent small venues, building on 2015’s nomination as an emerging artist in the British Blues Awards, winning a Reveal Records emerging act competition, an international song-writing semi-final spot for Suffer It Well from 2013 EP of the same name. Following the EP tour Ma Polaine’s Great Decline stay on the road for the festival season, with Towersey, Marlborough Jazz, Wonderfields, Sandwich Folk and Ale, Nailsworth Arts Festival to name a few. From the start Beth Packer and Clinton Hough always sought to keep their song-writing influences open. A strong base of blues is there, with jazz and country also holding sway, original writing is the focus, with oddness, sparsity and a subtle quality that is their own. There is a freedom for Packer to explore her vocal qualities and lyric writing, creating tales of haunting beauty, veiled sorrow, and a darker image of happiness. The live band has moved through several line-ups and have recently returned to their roots as a duo, live Packer moves between double bass, accordion and harmonica, with Hough on electric or acoustic guitar and an occasional percussive foot, all accompanying Packer’s powerful yet sensitive vocal.